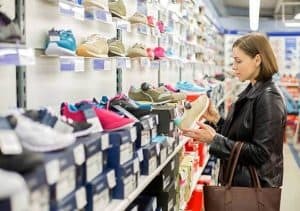 Trying to find the best shoes for flat feet can be a bit of a challenge, and might even give you a headache. Due to the structure of the arch of your foot, there is a need to find shoes that will effectively compensate for the lack of curvature between the ball of your foot and your heel. However, you won’t always find shoes made specifically for flat feet, or you may have difficulty in finding one. This is the reason why we’ve created this guide.We want to help you and be with you during your decision making process when it comes to purchasing the right footwear for flat feet. 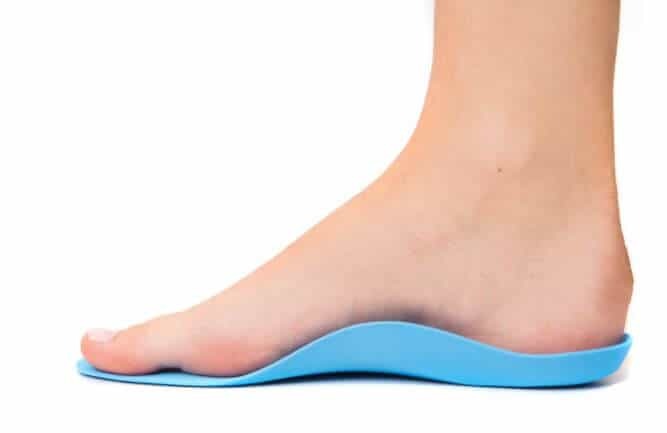 If you desire on being able to fully understand what having flat feet means, what causes it and how to find the best shoes for your flat feet, then do not hesitate to read on. In this post we will be including best dress shoes for flat feet, best walking shoes, best training and running shoes, and even the best sandals for flat feet for both men and women. There are separate posts about the best running shoes, best shoes for bunions, and best shoes for standing all day. 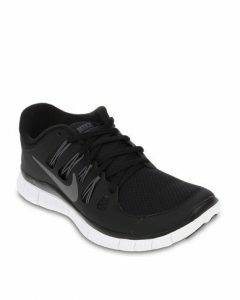 The Nike Free 5.0+ running shoes for women are a combination of modern technology and style. These qualities are what Nike sneakers have been known for so many years. This pair utilizes a clever asymmetrical lacing system that helps reduce the pressure on top of the foot. It also features the perfect cushioning and arch support for women with flat feet or those women with injuries like plantar fasciitis. But unlike any other running shoes, Nike Free 5.0+ Running Shoes offers to strengthen benefits. This shoe has diagonal cuts that help encourage the natural motion or gait. It also helps strengthen the foot and places less emphasis on the inward roll of the foot or overpronation. This means that this pair is great for reducing pain in the arch. For added ankle support there is a generous 2.5″ high shaft. This is almost ankle boot high, but low enough to make the perfect sneakers for flat feet. If you worry about getting the right semi formal or work shoes because of your flat feet, then, worry no more! We have found the pair where comfort, fashion and sophistication is rolled into one. The Trotters Danelle Dress pump is not only about comfort, but also pays attention to the beauty of a footwear as well. It is a classy looking pair that will totally look great with a semi formal to formal ensemble, even with your work clothes or uniform. When it comes to choosing the best dress shoes for flat feet, it is not enough that we pick one for comfort, it is also a plus that the pair looks pretty and elegant as well. With the Trotters Danelle dress pump, we surely could get both beauty and comfort. This pair has not only been intricately crafted and designed, they are also created for flat feet or for other foot problems and discomforts. This pair of fab shoes by Trotters utilize EVA insoles to give you an anti-impact and shock absorbent surface, it even boasts a stable heel for added comfort. The Danelle pumps features an arch cookie for a great arch support and an exceptionally beautiful and sturdy leather uppers. What makes the Clarks Heavenly Heart dress pump different from the other dress pumps is that this pair is undeniably super comfortable. Clarks do offer a wide selection of dress pumps that offer as much comfort as they do style. For all the flat-footed women out there, we handpicked the Heavenly Heart dress pump since this pair is versatile, stylish, and very comfortable as well. 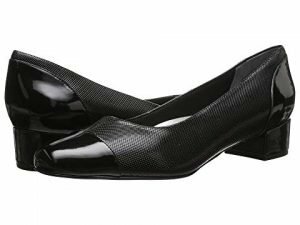 It features a classic court shoe profile and a 2.5-inch heel but also has an almond shaped toe that helps reduce the nasty toe pinch feeling that most higher heeled shoes can cause any woman, especially those with flat feet. Take note, the Clarks dress pumps are not only comfy but are also super stylish and fashionable. It is crafted with a premium leather upper that is matte but elegant and the under sole is specially coated to provide extra traction when walking and strutting your stuff. The specially made orthalite molded foot bed provides ample arch support and simply put, heavenly comfort while wearing the Clarks’ Heavenly Heart all day long. This pair can easily make a stylish day to night transition, as it will look as good with a formal gown as it will with corporate attire. The Vionic Walker Classic is another option for women with flat feet. This Podiatrist-designed casual walker offers incredible comfort for your everyday use. Due to its contoured arch support and heel cup, this pair helps you on your stride. Vionic Walker Classic shoe makes use of shock-absorbing EVA midsole and anti-bacterial removable orthotic insoles. Not to mention, it has a breathable mesh upper that allows your feet to stay cool despite hours and hours of walking. This Walker Classic by Vionic also has a flexible rubber outsole that is perfect for almost all kinds of surfaces. These motion control shoes are American Podiatric Medical Association approved. This means you can place your trust in them and spend your money with confidence. The Vionic Zen women’s walking shoes will feel great on your feet if you have plantar fasciitis, low arches, or overpronate. This is specially podiatrist designed orthaheel technology and it is second to none. The Vionic Zen women’s walking shoes fit snug. It also pads every millimeter of your foot. It offers that all-important stability and relieves your pain. Compared to other Vionic shoes, the Zen With Orthaheel Technology Walking Shoes is actually very good looking. Although these are advertised as women’s shoes, they can actually be worn by men too. This is based on their relatively unisex external design. However, they may run a bit small for males. So if you’re considering of purchasing, a size bigger would be a good idea. 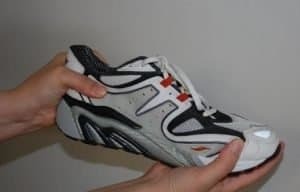 For any person seeking a pair of the best walking shoes for flat feet, the Vionic Zen With Orthaheel Technology Walking Shoes is certainly a recommended purchase at a low price. EVA midsole absorbs much of the shock. The Vionic Kirra is a very chic and easy looking sandals that are surely perfect for summer and trips to the park. This pair is ideal for keeping those flat feet cool during the warmer season. The Kirra is a fashionable combination of a triangular thong leather upper and subtle metal rivets and buckle detail. A cute back strap adds stability and adjustability. The out soles of these sandals are made with a patterned tread to provide traction for steady walking in all surfaces. It boasts its Vionic’s Orthaheel Technology, which is designed to fully support your arches. The EVA foot-bed also effectively absorbs shock, helping to reduce stress on your feet, ankles, and knees, and the ankle strap adds stability while allowing you to adjust the fit. Another admirable feature is that the Kirra is available in medium and wide widths, which is ideal for flat feet which tend to become wider as the arches collapse. Adidas Galaxy Elite women’s running shoes offer the two most important things: comfort and functionality. It has superb construction meant for women with active lifestyles. This product was made of durable materials meant to withstand the demands of your running and other activities such as training in the gym. It may also be used in class as dance shoes for Zumba. The Adidas Galaxy Elite women’s running shoes provide great support for women with flat feet with its supercloud cushioning technology. Also, the Adiprene helps in both propulsion and efficiency. It also provides the superb movement with the breathable mesh upper that helps support different angles of movements. As for its outsole, it is made of Adiwear which is known for traction and durability designed to withstand different types of surfaces. This sneaker offered by Saucony is no doubt a perfect choice for both men or women who are in search for a pair of the best shoes for flat feet. The imported synthetic material that is in Saucony Hurricane 15 Running Sneakers offers a power grid midsole with excellent support. Its frame provides a heel-locking technology for extra stability. Meanwhile, the synthetic sole it has is designed for those that suffer from overpronation. The Hurricane 15 by Saucony is designed to be lightweight. This shoe offers superior support to those that suffer from flat foot pain. The Saucony Hurricane 15 Running Sneakers was engineered with the active runner in mind. The company made sure to minimize the overall bulk of the sneakers but still ensure the proper amount of cushioning. This only means that you have a lightweight pair of sneakers designed to keep you moving and active without sacrificing being a pain-free pair of flat feet shoes. Dunham has been known to create the best dress shoes with a touch of versatility fit for every man. The reason why Dunham creates and strictly observes high standard manufacturing is that he likes to avoid all the harms and negative effects that can be brought about by substandard shoes. The Burlington Oxford by Dunham will surely work best for your flat feet since they offer superior comfort and arch support to avoid pain and discomfort. This pair does not look super fine and incredibly smart, they are also extremely easy and comfortable on the feet even when worn for a longer period of time. Many people love how this pair looks very smart and spiffy, they can also be easily worn at the office or even on casual days while grabbing coffee or just strolling along the park. These Oxfords are truly great if you want to do away with narrow and awkward interiors. Boasting their comfortable plush foot bed and extended sizes and widths, truly these shoes are perfect not just for flat feet but also for other foot problems. 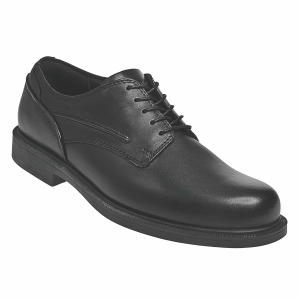 The Dunham Burlington Oxford is also a Medicare approved diabetic shoe. Nike Lunarglide 6 Men’s running shoes weigh in at only 2 pounds. The Nike Lunarglide 6 shoes are extremely lightweight which are quite possibly rated one of the best running shoes for flat feet.On the flip side, however, they are also very good walking shoes that is worth your money. This is due to its subtle design and amazing build quality. Talking about design, if you’re the indecisive type, you may struggle to choose from the 28 different men’s variants. You also might want to know that there are even more choices for women. The Nike Lunarglide 6 Men’s running shoes are supportive, durable, stylish. Depending on your choice of color, these sneakers come available for both sexes. The external aesthetics of this footwear hasn’t been sacrificed or neglected in any way. Apart from its outside beauty, it even put emphasis on comfort and internal orthopedic support. These running shoes haven’t fallen behind when it comes to research and development. This pair of shoes is perfect for over-pronation and is from a trusted manufacturer. Overall, the Lunarglide 6 is a highly rated all-rounder which is adored by all who own a pair. If you are someone who loves to wear durable-looking shoes, the Dansko Wyatt loafers are perfect for you. This pair is made of durable and well-designed leather uppers that can stand long-time wear. This pair is partnered with Oxford rivet, unique stitching details which further enhances a much fashionable look. People with flat feet tend to have more sensitive feet that is why it is important that they pick a very comfortable shoe to avoid pain and possible injuries. These loafers will be great for the flat-footed men out there since they provide more cushion because of its removable triple density EVA molded comfort footbed with a padded collar and tongue that ensures comfortable fit. A well-cushioned shoe from all sides means that your foot will be comfortable at any angle. It also boasts a polyurethane mid sole that substantially reduces abrasions and friction from too much walking while still absorbing shock upon impact. It is also made for superior arch support and efficient shock absorption with firm, flexible and slip resistant rubber out sole. This is surely a great casual to semi-formal footwear for those with flat feet. The shoes manufactured by Brooks may be internationally considered one of the top rated and most popular running shoes. But they also produce excellent shoes for walking too. The Brooks Addiction walking shoes for men are available in white, black and bone, brown suede and white. It’s one of those additions which caused so much hype when these were released. Brooks Addiction Walking Shoes are fairly priced. And for the amount it costs, you cannot complain given the number of pros over cons. These sneakers were designed to provide strong support, and a reliable, slip-resistant outsole. These shoes will provide you all the traction you need. 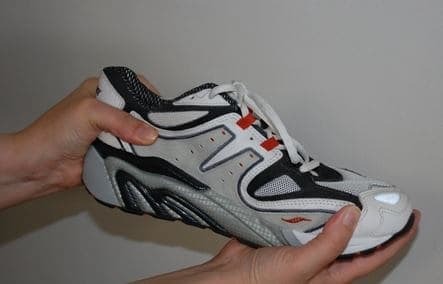 Podiatrist actually recommended Brooks Addiction Walking Shoes. Because they provide perfect low arch support, combined with an award winning midsole comfort make this one of the best walking shoes for flat feet. Mizuno has since unveiled one of their greatest creations ever, the Wave Creation 17. These running shoes for men with flat feet are made of imported synthetic materials. Even its sole is synthetic. You are sure to enjoy any activity whether walking, running, or working out with its 1 inch of platform height and flex grooves for the articulated forefoot. Mizuno designed a neutral midsole and a Smooth Ride fluid motion using the lightweight material. This most importantly offers superior comfort and support. Ultimately, this makes them a superior choice of shoes for your flat feet. The Mizuno Wave Creation 17 Running Sneakers’ upper is created using a flexible mesh dynamotion fit technology. And the signature Infinity Wave design ensures maximum flexibility. The Wave Creation 17 comes in several colors. It is also available in both a men’s and women’s version in numerous variations. This next pair of shoes is an extremely an adequate pair of flat feet shoes which has added much. The Asics Gel Super J33 is full of detailed design and made of all the perfect materials that warrant its quality. Asics Gel has added the Super J33 to its range of all new, stylish, lightweight and comfortable sneakers. Mind you, this is currently reigning as one of the best running shoes for flat feet. But even if running is not your thing, like the Nike Lunarglide they are great for walking too and the various designs can blend with any outfit. The fitting for Asics Gel Super J33 is perfect. It has plenty of foot arch support. Generally, the overall build quality makes these top rated sneakers. Most people, even the flat-footed, consider the Olukai Ohana as the most comfortable flip flops. Most people with flat-feet experience discomfort when wearing the regular flip-flops due to lack of support and very plain and flat structure. But with the Ohana sandals, everything is totally different. 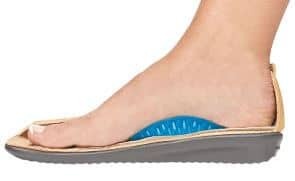 Many people, especially those who love going on beach adventures or who can wear flip-flops all year round, rave about how comfortable the Olukai Ohana is, its structure and built-in arch support have been getting praises and good reviews. People with flat feet find that these flip flops are able to provide the support and comfort that they need. The mid-sole is anatomically shaped. Keep in mind that flip-flops are not ideal for walking uphill or downhill since it will not have much support and good positioning. A sandal with a heel strap will keep your feet positioned better. But if you’ll be strolling on level surfaces, this is a good choice. The Olukai Ohana sandals are available for both men and women in a wide variety of colors. These shoes are a good option if looking for stylish and comfortable footwear that doesn’t give your feet a constrictive feel. Birkenstock Arizona 2-Strap Cork Footbed Sandals is made of suede. The arch support is perfect for people with flat feet. It is open toe and has an overall medium width which gives your feet room to move around. The two straps are fully adjustable to a loose or tight degree. What makes Birkenstock Arizona 2-Strap Cork Footbed Sandals the best sandals for flat feet is its anatomically correct cork footbed. In addition to this, the EVA midsole helps in absorbing the shock of every step, improving gait and providing pain relief to those fallen arches. In addition, it has added comfort features such as a soft lined upper and a Birko-Floor upper that has a leather-like finish. If you try to examine a normal foot, you will see in the middle that there is usually an arch. You will see an area of the foot which doesn’t make contact with the floor. There are people who have higher arches compared to others, and there’s nothing wrong with this. It only becomes a problem when there is no arch and the full base of your foot comes in contact with the floor. Fallen arches, known as flat foot will cause different kinds of pain numerous areas of your lower body. Having flat feet can even bring your joints out of alignment. Mainly, the pain will occur in the feet, ankles, and lower leg muscles, specifically in the arch and heel region. Having flat feet can also lead to a weakening of your posture. You will experience discomfort through your hips and lower back. Running, walking or even standing can be very painful. There are actually two different types of flat feet or fallen arches. There is the pathological flat foot and physiological flat foot. Resulting from a combination of increased joint mobility and fat in their arches, most babies and toddlers have flat feet. Physiological flat feet are symmetric and do not have any movement restriction and generally painless. Meanwhile, pathological flat feet have some symptoms. As the name implies, pathological flat foot occurs when your fallen arches are accompanied by stiffness and other pain symptoms. A physiological flat foot is symmetric, do not have any movement restriction and are generally painless. 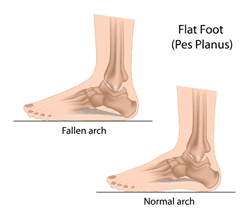 Physiological flat foot occurs when you have fallen arches but they do not necessarily cause disability. In some cases, older people develop asymmetric flat feet. This means that they had normal or slight-flat feet that suddenly collapse into severe flat feet. Causes for having flat feet are quite wide and varied. Flat feet may be congenital. But this painful condition can often be avoided. Primarily, you will need to understand that the tendons and ligaments in your feet and lower legs help and stabilize your arches. When these tendons and ligaments in your feet weaken, your arches will collapse and cause your foot abnormality. However, flat feet do not cause any symptoms until late childhood due to the arch not forming fully for some reason. 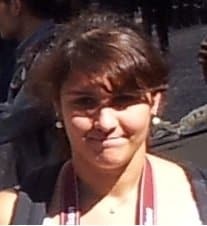 It can also be hereditary and can often be present from birth. It is quite common for children to have flat feet. As children grow older, it’s not always easily identifiable at first. This is because most kids appear to be flat footed due to baby fat and their development. If a toddler presents with painful feet, it can be an indication that another process is going on. A pediatrician or orthopedic surgeon should examine a young child with painful flat feet. Older children aged 10 to 12 years old and young teens with painful asymmetric flat feet may have a condition called a tarsal coalition. This is a separation of the foot bones. It’s usually in early adulthood when flat feet problems arise. The condition is picked up through some kind of bottom of foot pain complaints or other r eported problems from any joints in the lower body. An acquired flat feet in adults usually have tissue breakdown which contributes to the deformity. The tendons, ligaments and sometimes joints wearing out factor into the problem. The collapsed arch which occurs during adulthood often arises due to excessive stress on the foot. Examples of this are standing all day at work or walking in high heels for long periods of time, wearing uncomfortable shoes without proper support, failing to treat foot injuries, or not allowing enough time to heal ankle sprains and broken bones in feet. The most important key to reducing pain is wearing the correct well-fitted shoes. A good pair of flat feet shoes are ones that are supportive and that fit well with plenty of padding and good arch support. A cheap and rather effective pain relief method is to use custom orthotic inserts inside your shoes. Fitted insoles or orthotics are custom-designed arch supports. These may relieve pressure from the arch and reduce pain if your feet roll too far inwards. An orthotic only brings benefit while it is in use. This is not a long-term solution though. It will depend on the severity and be taking painkillers if you have any discomfort can be comforting. But you need to remember to always notify your doctor of any changes you intake in your medication. Doctors may advise some of their patients to rest and avoid activities that may make their feet feel worse until symptoms improve. Obesity is a common cause of pain in the foot or fallen arch. And so losing weight if you’re overweight is an effective way of reducing flat foot pain. And remember this has many other benefits too. Some children’s bones do not develop properly. 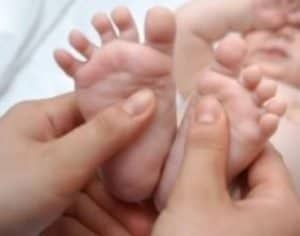 This will result in flat feet from birth that may continue into adulthood. In these cases, surgical intervention may be necessary to separate fused bones. But this is rare. Wearing the right footwear is the simplest, cheapest and effective way of treating your flat foot pain. To wear the right shoes for flat feet is the most important solution for anyone with fallen arches. Continue reading to understand the important characteristics that would make an ideal pair for flat feet shoes. Your shoes are the critical part of your standing, walking and running form. As we know, most of us humans can easily form sentimental attachments to our most possessed things such as our favorite shoes. If your usual shoes are no longer providing comfort and padding it’s high time you buy a new pair. Experts say that the average life of a pair of running shoes is 400 miles. Now, this may sound like a high figure. But in reality, it’s not much for the average walker or daily runner. Your shoes may look new on the outside, but it’s the condition of the interior which ultimately determines whether the shoe is finished or not. For instance, the arches of your shoes have begun to drop. Its toe box has become too wide and the heel padding has worn thin. These will all lead to various types of foot pain, including fleet feet. 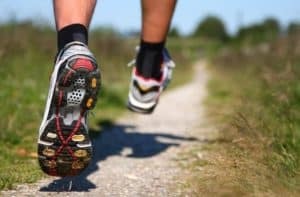 So, even though you have been wearing the best running shoes for flat feet more than 400 miles, perhaps it’s time for you to replace them. 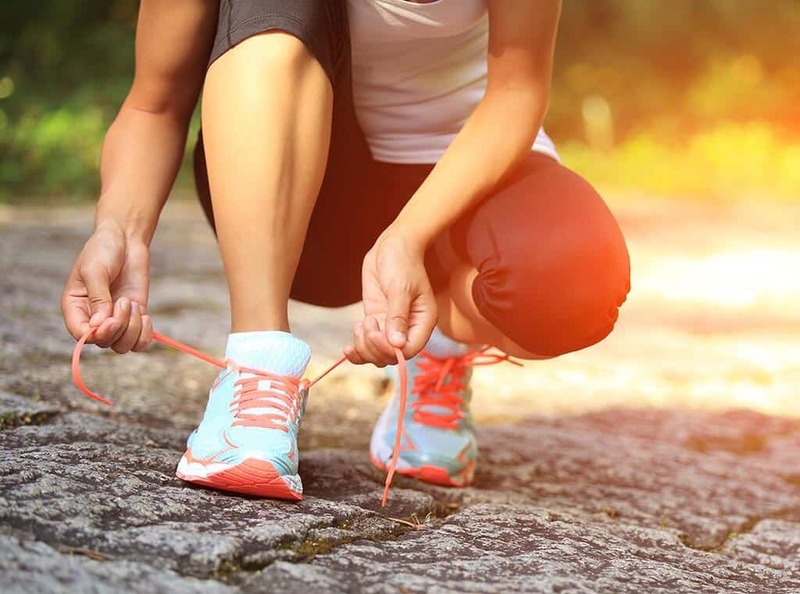 Remember, as your footwear gets old and out of shape due to frequent usage, they will gradually loosen in areas which are required to provide that all important support. Note that it is important that there isn’t too much play or roll in the heel while you are walking or running. You need to make sure that the heel area of your shoe is stiff. It also has to be firm and relatively close to your heel edges. If the fit is too loose, then this is not good. This is because it can cause injury. And if it is too tight, this is also bad. Because this can lead to you getting bunions. So, you should look for something that’s in-between. We know finding a balance can be difficult, However, a large majority of podiatrist designed flat feet shoes to fit as expected. This is due to the extensive research and professional expert opinions that go into designing shoes for flat feet. Rigid soles are a common inclusion in most conventional footwear. Fallen arches mean a tendency for the feet to lack stability. This is why flat footed people need a durable and rigid shoe which has no play. And one that doesn’t twist and turn with every step. Generally, a good footwear will not bend in the middle. You only need to buy footwear that does not bend except at the toe. If there is too much bend and twist going on in your shoes, eventually it will reach the affected midfoot area. And the pain in the foot will be excessive, causing you more discomfort with every step. The best shoes for flat feet are most certainly always the shoes that have good arch support, as well as orthotic device inserts. Without good arch support in your shoes, your fallen arches will continue to make full contact with the footbed. Your tendons and ligaments will continue to be strained and cause you to have unbearable pain in feet. Aching feet and overpronation are a few of the common problems that fellow flat footers face. Overpronation of the foot is not an injury itself. But if one over pronates then he or she may be more susceptible to a number of sports injuries. Overpronation is often recognized as a flattening or rolling in of the foot. However, it is not quite as simple as that as the timing of when the foot rolls in are also important. As we have mentioned previously, the weight distribution across the entire foot is what would cause the aching foot. Again, this can often be relieved by wearing shoes that have the proper arch support and are fitted properly. If you can just imagine for a second that flat feet have the entire foot touching the ground. Whereas the arched counterparts actually only have a section of their foot on the ground. The arches in your shoes are designed to lift the foot in the required area. Thus, taking pressure off the upper body weight. It is for this reason that arched shoes are a bit narrower. And if you have been walking in them, your feet may feel cramped or ache after long periods of use. You may need to wear shoes that are wider than normal to alleviate some of these aches. Think of it as though the arches are like foundations in buildings and are purposed for carrying your whole body weight. Therefore, without adequate arch support, your bodyweight will weigh down on your arches, causing them to eventually collapse. Some shoes, especially those of men’s formal and women’s heels, have no arches on their insoles. Remember, this is not the type of footwear you should be wearing if you have a collapsed arch. 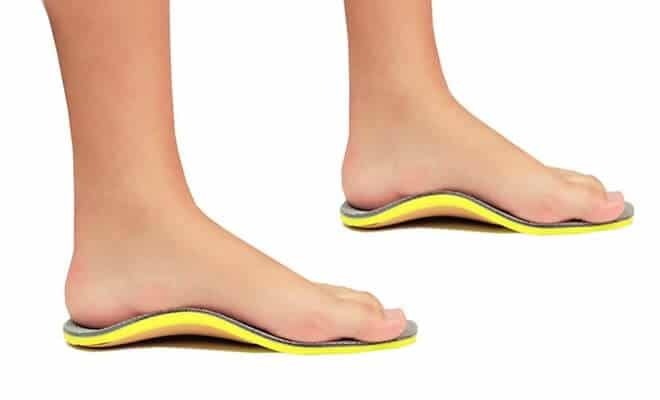 Orthotic inserts are medically prescribed types of equipment and appliances that raise your middle-foot to form an artificial cushioning curvature as found in normal feet. Usually, it’s just not enough to think that you already have the perfect shoes at your disposal. Your shoes may be new and seem to have quite decent arches. Or perhaps they are supposed to be great shoes for flat feet. But in this case, it would be ideal if you can remove the original footbed and have it replaced with separately purchasable orthotic inserts. 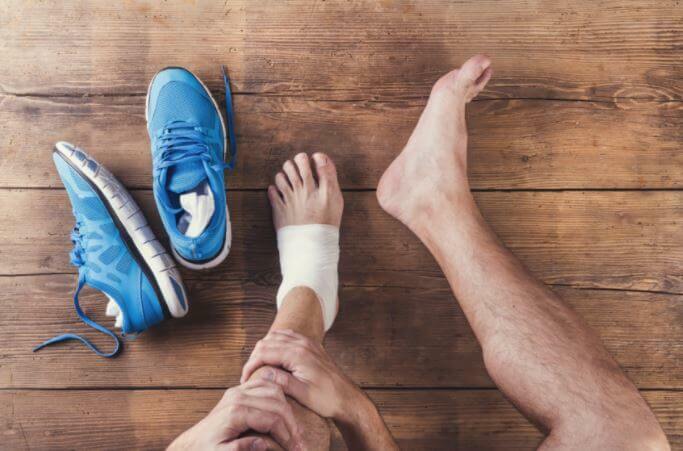 In some occasions, you may find that having a specialist orthotics is needed to help reduce the pain that you are experiencing with having a flat foot. In fact, having orthotic inserts work well. And a reason for this is that orthotics help in distributing weight and pressure. Orthotic inserts offer additional support while walking, standing, and running. It can be hard to know which pair of shoes to buy with all the different styles out there. For people with fallen arches, running shoes make a good choice. Running shoes usually have ample arch support to deal with the continual pressure placed on your feet– pressure that is caused by the motion of running. Usually, it is the running sneakers which prove to be the best shoes for fallen arches. One reason for this is that they tend to have good arch support compared to everyday fashion shoes. However, there are other types of footwear which are just as good. Yet this kind of flat feet shoes have usually been designed with podiatrist input and specifically targeted for people with fallen arches. This type of footwear is most commonly associated with walking contrary to the complex and expensive research which goes into the manufacturing of the running shoes mentioned earlier. When buying running shoes, there are two main types that you need to consider. One is motion control running shoes which are for heavy over-pronators. These offer the best support and stability. Another is the stability running shoes. These are ones which aid gait and ensure good support and comfort at the same time. These types of shoes have a lining of foam at the instep. This lining cushions your arch region. Stability control shoes also offer support and comfort to your flat feet because the soft region makes it comfortable to fit your low arches. The second types of shoes come as a blessing to runners that have low arches and those who usually indulge in rigorous over-pronation. The support that motion control shoes provide on the side of the arches also makes running and long walks a comfortable experience. It provides good support and comfort at the same time. In this video, a Certified Pedorthist and Executive Vice President of Aetrex Worldwide, Inc. Matt Schwartz describes low arch and flat feet, and the technology available to determine your foot type. This video includes an overview of how low arch and flat feet function, the kind of conditions and setbacks associated with them as well as some potential solutions to help avoid the setbacks. There is an estimated 20% of the adult population having flat feet. For the individuals in the shoe-making business, this highlights a key prospective target audience. This gap has been identified. And it has been perfectly filled, for there are various types of flat feet shoes available on the market now. They now understand the anatomy of flat feet and ensure that they offer you comfort and soothing experience in your daily routine. Some of the essential requirements and types of equipment for your flat feet shoes are the arch support that reproduces normal foot curve, shoes with raised insoles, and various medical orthotics. The arches of your sneakers serve a shock and weight absorber when your feet touch the surface. People who do not have an arch usually exert much pressure on their foot. And this can lead towards tendon damage. In order to avoid this painful situation, artificial arch supports functions as spring to distribute the weight evenly on your foot. There are various shoes that have raised insoles that build an artificial footrest. The higher insoles provide support to the middle-foot which proves to be beneficial for your flat feet. 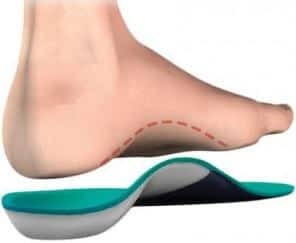 Medical orthotics are medically prescribed pieces of equipment and appliances that raise your middle-foot to form an artificial cushioning curvature as found in normal feet. It is an interesting fact that most of us tend to neglect the comfort of our feet by compromising on any footwear that looks pretty, gorgeous or perhaps with a good bargain price in this modern world. Taking care and protecting your feet is important to alleviate any potential problems in the later part, most especially if you have flat feet. Therefore, the next time you want to buy shoes for your flat feet, please make sure that you keep in mind all the tips provided in this guide.